Let me just say. These are fabulous. So summery and yum. I love honey, and in this recipe it just adds such a nice sweetness and that distinct honey flavor UGH it’s wonderful. These were nice and easy to make and so so great. No weird ingredients or anything; with the exception of the rather surprising amount of jam, you might even have all of this stuff in your kitchen already (I did)! I found this recipe forever ago on Pastry Affair and I’ve been meaning to try it for ages. It was well worth the wait. Although if I made it again, I would have put a liiiittle less salt (maybe 1/4 tsp. instead of 1/2); I’m not a huge fan of saltiness in baked goods and I feel like personally, it was a bit too much. Also, since I didn’t have any whole wheat flour, I just used a full cup of all purpose. Honestly if you’re eating something like this, is the half a cup of whole wheat flour really going to make a difference in terms of its healthiness? I feel like probably not. Slash I just don’t really care. Dessert is dessert, right? 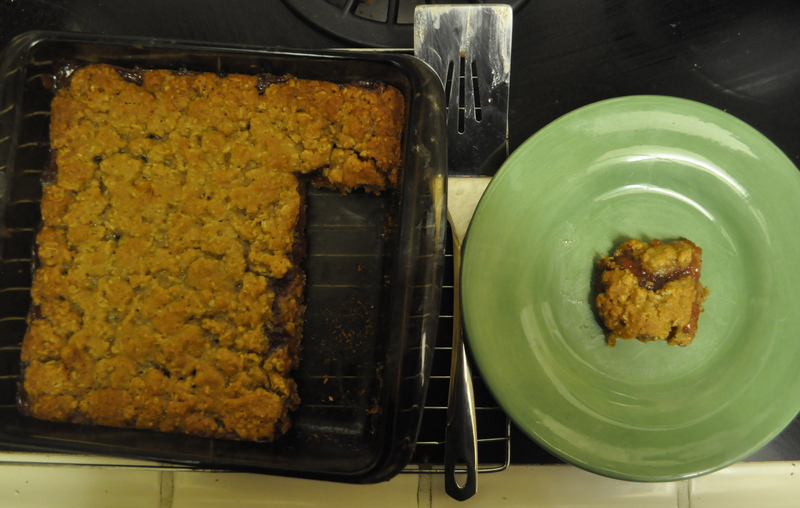 If/when you make these bars, my word of advice would be to eat at least one while they’re still warm. It’s like a little strawberry cobbler square…I bet it would be absolutely fantastic topped with a scoop of vanilla ice cream. OH the possibilities. Preheat the oven to 350 and lightly grease an 8×8″ pan. Cream together the butter and sugar in a large bowl. Once combined, add the egg and the honey and mix. 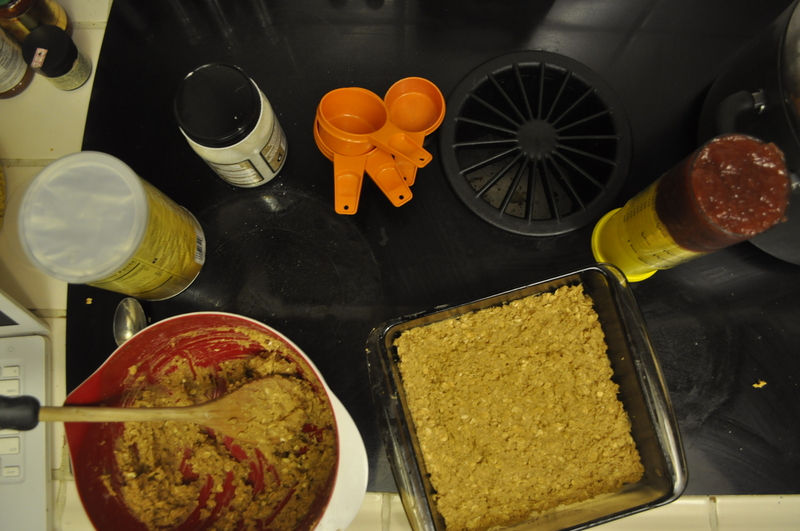 Next, stir in the oats, flour, baking soda, and salt to make the batter. Press 3/4 of the batter into the bottom of the pan. This batter will be pretty sticky, so good luck getting it off your hands if you’re using them! (I used the back of a spoon to help me out here.) Now, spread all of the jam on top of this layer. It may strike you as a lot of jam…I was a little grossed out by the amount. When I was spreading it I felt a little like I was spreading pizza sauce, which was a little disconcerting. But it turns out fine, I assure you! Once spread, crumble the rest of the batter on top and stick it in the oven for 25-30 minutes until the top is slightly golden brown. Let it cool a couple minutes before you cut it (I know, waiting is hard) and enjoy! LOOK AT THAT OOEY GOOEY GOODNESS. I wish I could somehow share with you how delicious my entire house smelled after I baked these. It was pure foodie bliss. 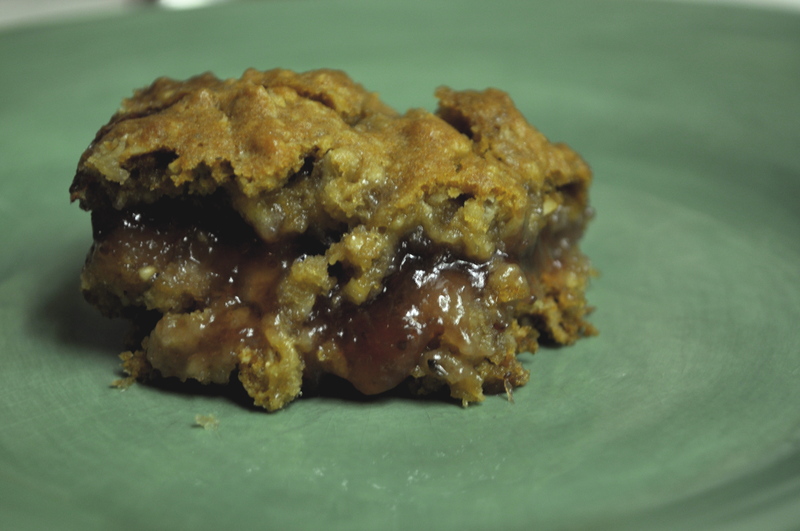 Categories: Breakfast, Dessert | Tags: bars, dessert, honey, oatmeal, strawberry | Permalink. Nothing quite says “summer” more than fruit. 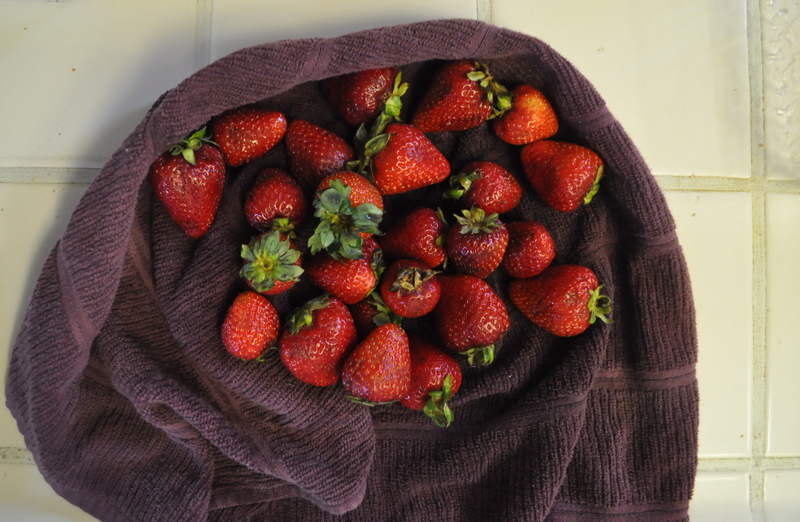 And no fruit says “summer” more than strawberries, right? I mean, okay, maybe watermelon, but watermelon would probably not be good in a cake. Too much water. Ha. But that’s beside the point. This would be the perfect dessert to bring to a summer barbecue potluck/picnic/garden party (holy unintentional alliteration). I don’t know about you guys, but someone says “potluck” and I immediately volunteer to bring dessert. It gives me an excuse to bake a lot of delicious goodies without having to worry about them sitting around my kitchen, trying to hide them from myself, and eventually caving and eating them all (I have little to no will power, sad but true). This cake is as aesthetically pleasing as it is delicious; bring it to share with everybody and your friends will love you forever. People you are trying to impress? Consider them impressed! I mean, come on, try to name someone who doesn’t love strawberries. List is short (or non-existent), right? They’re just so great. Even in cakes. When I saw this recipe on Smitten Kitchen, it was immediately bookmarked in my unnecessarily extensive “recipes (yumz)” folder. This cake just looked so so pretty and summery and happy. I’m not a huge cake fan (I’d choose pie almost any day), but this one was quite honestly amazing. I will most definitely make this again. 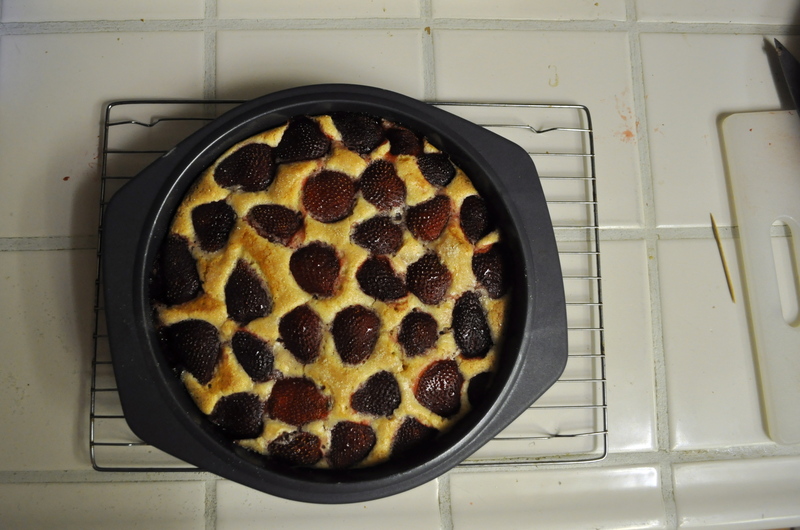 The strawberries get so gooey in the best way possible and the cake part is soft and perfect and yum. My brother ate almost the entire cake tonight alone–which is about the only way he compliments my cooking/baking, by eating it–so I guess I did something right. Definitely eat a slice of this while it’s warm. While it is a little more difficult to cut and get a slice out intact this way, it is so worth it. Make this cake! Do it do it do it! Preheat the oven to 350. Butter either a 10″ pie pan or 9″ cake pan (that’s what I used, it made the cake a little thicker); a 9″ pie pan will overflow, so don’t use one! Whisk together the flour, baking powder and salt together and set aside. In a large bowl, beat together the butter and the sugar with an electric mixer for a couple minutes until the mixture is light and fluffy. Mix in the egg, milk, and vanilla until they are just combined, then gradually add the dry mixture until it’s all mixed together in a beautiful, creamy batter. 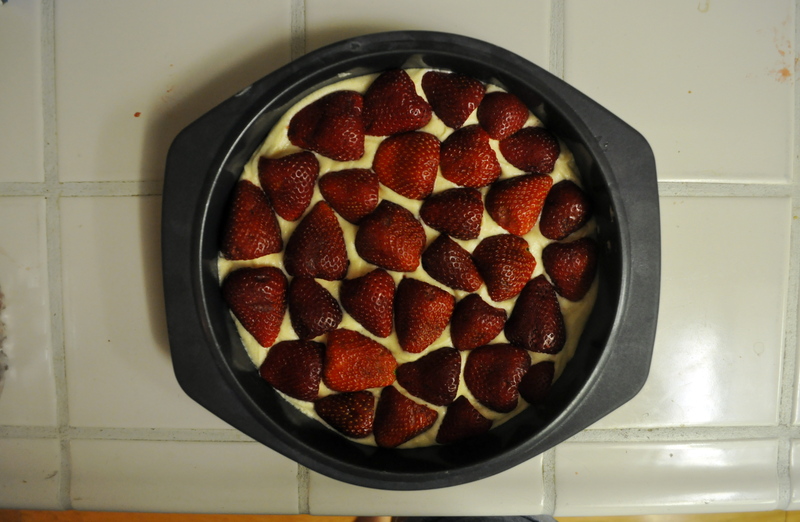 Pour it into your cake pan and arrange the strawberries seeds-up on top of the batter as closely together as possible. Sprinkle the 2 tablespoons of sugar you set aside on top of the cake and stick it in the oven for 10 minutes at 350, then adjust the temperature to 325 and let the cake bake for another 50-60 minutes until a toothpick comes out clean and the edges are lightly golden brown. Beautiful. 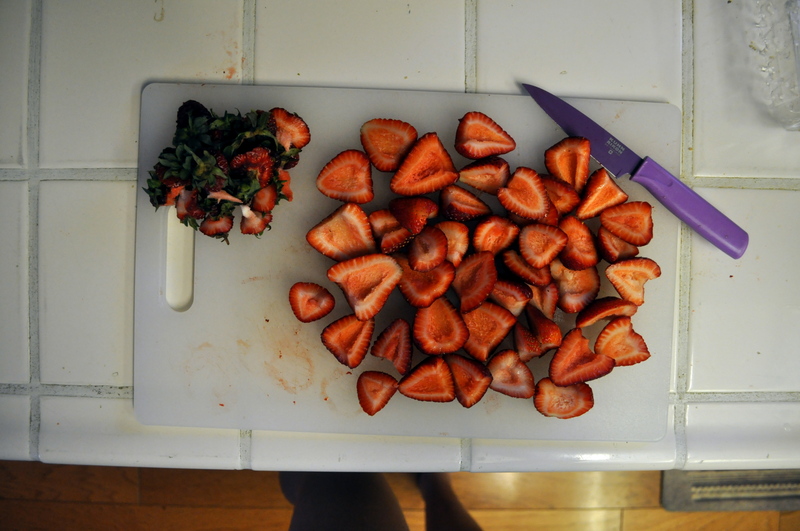 I do realize that the strawberries look black here. They’re really not that dark, I promise. The photo is just weird and I really didn’t feel like editing. Categories: Uncategorized | Tags: cake, dessert, strawberry, strawberry cake | Permalink.